Hi. I'd like to get a sub 22 min for 5km. I'm a 33 year old female, pretty active, I've been a runner for about 10 years as a way to keep fit. I run 25-30 miles on and off road. Plus I cycle 50 miles every week. My best 5km is 22:13 but can't seem to better it at the moment. I do a mixture of distances, from 800m reps (I do between 3-6 at the moment) to 10 miles steady runs. Currently training for a 1/2 marathon in 3 months. But I really would like a sub 22 minutes for a 5km, if not sub 21. Thanks for your question about getting to sub-22 on the 5k. You note you are training for a half marathon at the moment. It will be a bit hard chasing two goals at once. The focus in half marathon running training is more on long runs, easy runs, steady state runs and tempo runs. For 5k running training all of those are important too, but the focus shifts towards speedwork a bit more. So, first of all, it is probably good to make a decision: will you start chasing your 5k goal now, or do you train for your half marathon? My suggestion would be that you continue training for the half marathon at the moment, then use that training as a base to run a fast 5k a bit later. Maybe your half marathon training itself will provide you with sufficient improvement to break your 5k goal, who knows. Your running training sounds reasonably varied. I'd make sure that you get plenty of tempo running and long runs in over the next three months. The half marathon is a great distance as you can make sure that you cover the distance and more in your long runs, an excellent confidence-booster. When doing intervals (restrict this to a maximum of once a week in your half marathon training period), 6 x 800m is a good workout, but try to vary this with different distances, e.g. 12 x 400m, 4 x 1,200m, 3 x 1,600m etc. At this stage of the preparations I would probably opt for 2-3 tempo runs every fortnight, 2 long runs, 1-2 interval sessions and 2 steady state runs. That, in combination with the bike riding you are doing should set you up for a good half marathon. Then after that, get ready for your 5k. You can back off on the length of the long runs a little bit and do some more interval running (e.g. 2-3 interval sessions per fortnight, instead of 1-2). I would hope that this will help you get there. 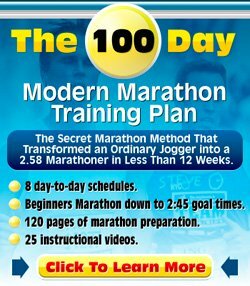 Running Training section - For all the info you need regarding long runs, easy runs, tempo runs, intervals, etc. Increasing Mileage Safely - Increase your long run steadily over time, but do it safely.